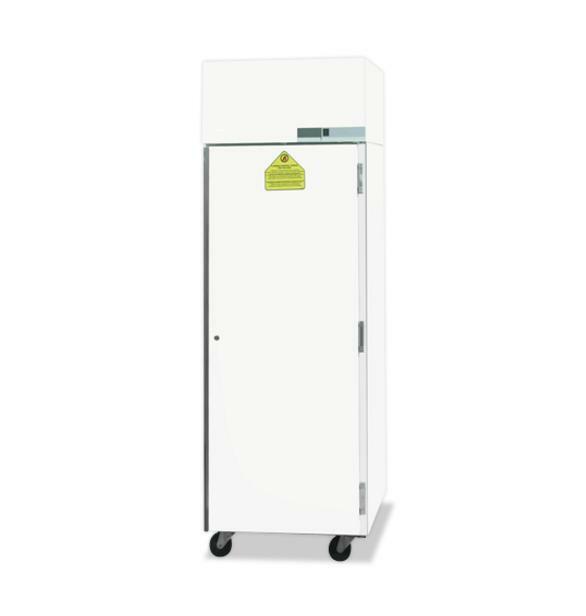 FR2004001 Flammable Storage Fridge has an adjustable control range of 2°C to 10°C, factory preset at 4°C., with an internal chamber thermometer. Flammable Storage Refrigerators are used to store volatile flammable liquids. With this unit, fire/explosion risk can be minimized. For storing materials in approved containers, Class 1, Div. 2 storage of flammable liquids per NFPA Standards, 70, 99, 45, 497A, UL 471. Note: Combustible materials may be stored inside cabinet, but the cabinet is not approved for Class I, Division 1 Explosion Proof locations. (Please see NFPA, NEC Codes.) This is a cold wall refrigerator which employs evaporator tubing embedded in the sidewalls, back, and top of the unit. During the refrigeration process, heat is removed through the evaporator tubing and expelled through the condensing unit. Condensation and frost may form on the interior of the cabinet and should be periodically wiped dry. The factory confirms that the units comply with current requirments for the Standard for Commercial Refrigerators, UL 471. Additionally, compliance with the requirements for Flammable Materials Storage Refrigerators defined by NFPA 99 and NFPA 45 has been established. B) Installed above the storage compartment or on the outside surface of the refrigerator where exposure to hazardous concentrations of vapors will be minimal. These units emply no defrost system. They are intended for use indoors in climate controlled areas. Instilations require 4" clearance on all sides and top. For storage of flammables in approved containers for Class I, Division 2 Storage of Flammable Liquids per NFPA Standards, 70, 99, 45, 497A, UL471. Interior cabinet liner and interior door panel are smooth aluminum Cabinet and solid door are foamed-in-place with CFC Free high density polyurethane foam insulation. Warranties: 18 month parts and labor, 5 year compressor (US and Canada), 18 months parts (International) UL/CUL listed.